What version of SolidWorks can my students use when working on their final year Student Assignment? For the past number of years the State Edamination Commission have accepted the Student Assignment created in any version of the SolidWorks Software. Schools will be informed by the SEC if there any changes or updates to this arrangement. 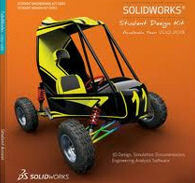 Do all SolidWorks files have to be saved as pdf files for the Student Assignment? No. The Drawing files are the only SolidWorks files that are saved in pdf format. These go into the “Portfolio in Electronic Format” folder. All SolidWorks files (Parts, Assemblies, Drawings, eDrawings) are saved into the “Part A” and “Part B” subfolders in the “SolidWorks Files” folder. What should my students be putting in place of their ID numbers on the Assignment as they won't have the examination numbers before the submission date? As examination candidate numbers may not be available in time, students should use their name and date of birth as a means of identification on their design portfolio and on the main folder contained on the CD or USB. The name of this folder should be in the following format “DCG SA 201? (Student Name Date of birth). E.g. “DCG SA 2016 (John Smith 04-07-1998)”. Please note the use of dashes in the date of birth format. Who do I contact regarding DCG or Technical Graphics queries? Where can I get guidance on what should be included in a completed DCG Student Assignment? When is the Student Assignment issued to schools? What pages of the Student Assignment needs to be scanned? I am concerned that some of the pupils doing the higher level will be out of their depth when doing the terminal examination, but are working very well on the Student Assignment. What is your view on students doing the Ordinary level paper even though they will be handing up a Higher level project?